Francis Hajek has represented thousands of injured railroad workers. The cases range from death, quadriplegia, loss of limbs, cancer/mesothelioma, career-ending back, knee and shoulder injuries, to hearing loss, carpal tunnel, back and neck sprains, to hyper-extended fingers. 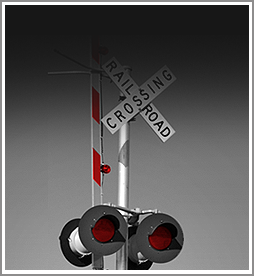 We have tried these railroad injury cases together at times and individually at times. It depends on the case. An injury should not be viewed through a lawyer’s eyes as a big or small injury case. It should be viewed through the injured person’s eyes as very important to them. It is not the policy of our firm to turn away injured railroad workers because we will not make enough money off their case. We try to accommodate all injured railroad workers. I was once a railroad worker and Francis is a kind person who tries to help all people. In other parts of this website you can read about our million dollar verdicts, but I would like to tell you a story about a case involving 4 days lost time. A railroad worker at the Norfolk Southern coal pier injured his right thumb when a cut lever failed to operate properly. He was diagnosed with a severe sprain, missed four days work, but claimed permanent damage to the thumb. He and the claims agent were a few thousand dollars apart from a settlement. This man stood up to the claims agent and said no. He hired Eddie Wilson as his lawyer and a lawsuit was filed in Norfolk, Virginia, the home of Norfolk Southern Corporation. The first trial lasted two days consisting of testimony from witnesses and doctors for both sides, including my client. Arguments were made to the jury and the verdict was $115,000.00. However, the judge said too much, try again. We did and got $85,000.00 the second time. Again, the judge said too much, and I accused him on the record of favoring the railroad over Mr. Key. Third trial, the railroad got scared and settled the case, because under Virginia law the judge can’t take the money verdict of the third trial. Wilson & Hajek have tried railroad injury cases in Virginia, North Carolina, West Virginia, Florida, Washington, D.C., Maryland, Ohio, and South Carolina with much success. Our railroad injury trials covered all types of railroad injuries on trains, in yards, in shops, on sidings, railroad crews hurt at crossings, passengers and crew injured in passenger train collisions, chemical exposures, hearing losses, lung disorders and other occupational injuries. We are proud of our record and we fight hard for the big and small claims of injured railroad employees. Through my experience, I know the experts necessary to try cases, from economists, to occupational therapists, to medical personnel for independent examinations. As far as experience goes, the old saying is very true we have it all.